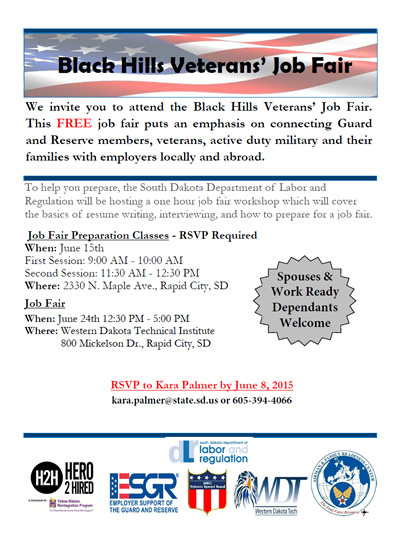 The Airman and Family Readiness Center along with Hero 2 Hired, ESGR and the SD Department of Labor are pleased to announce the 2015 Black Hills Veteran’s Job Fair. This event will be held on Wednesday, June 24, 2015 at Western Dakota Tech (WDT) from 12:00pm to 5:00pm. This event is open to active duty, veterans, spouses, and work ready dependents. We will have local and national employers and helping agencies signed up. You do not have to register to attend.